If you think the guy wearing the bandanna and strange wig looks familiar, don’t worry, your eyes aren’t playing tricks on you! 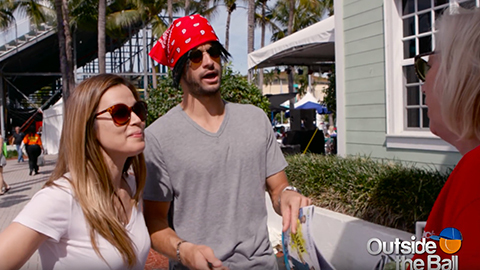 In this video, Grigor Dimitrov disguised himself as “Johnny”, a unique character that was on a mission to spread thanks and appreciation to the Delray Beach Open. Every tournament has a hardworking crew behind the scenes that help make the event what it is. Dimitrov joined Outside the Ball to put these amazing people in the spotlight and treat them like the real stars that they are! After trying on different attire to find his perfect disguise as a regular tennis fan, the Bulgarian went incognito with host Mayleen Ramey. The two approached volunteers and workers around the grounds to give compliments, ask for autographs, and pose for photos. When asked which tennis player was her favorite, a woman proudly answered, Roger Federer. “Okay, (do you like) anyone out of top 10? From a small country maybe?” Grigor playfully hinted. Ending with a high five and a hug, Grigor and Mayleen’s thank you tour around the Delray Beach Open was a success. We want to thank Grigor Dimirov and the tournament staff for making our time there so special! How Well Do Fans Know Grigor Dimitrov? Find Out in the Grigor Dimitrov Fan Challenge! Grigor Dimitrov Plays Target Practice Blindfolded Did Dimitrov’s Wimbledon opponent Djokovic plant these difficult questions for him? Is Grigor Dimitrov Joining a Boy Band? 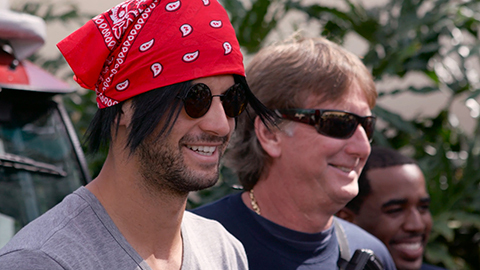 Watch Dimitrov Get His Groove On to the Backstreet Boys. Novak Djokovic, Wimbledon Champion, and Grigor Dimitrov Do a Strip Tease Dance on the Court What do Wimbledon semi finalist Dimitrov, Gasquet, Del Potro and Janowicz think of things British?